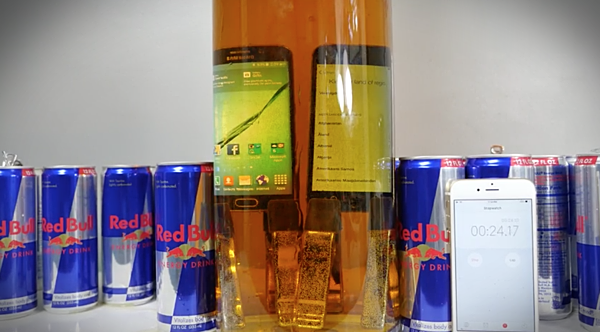 Have you ever wondered what would happen if you put two flagship smartphones into a tube of Red Bull energy drink and timed how long it took for them to die? As it turns out, that’s exactly what a YouTube user was wondering, so he decided to carry out a little experiment that involved over a thousand dollars of smartphones and a few cans of energy drink. You know, because the nights are long and television isn’t what it used to be. Keen to see whether an iPhone 6 or Galaxy S6 Edge would last the longer when submerged in Red Bull, this intrepid YouTuber dunked a pair of them and started the stopwatch. At around the 9-minute point we see Samsung’s phone get into a spot of difficulty, and when it’s retrieved from its sugary grave it initially looks like things may spring to life but alas, it’s dead and gone for good. The iPhone 6 on the other hand has seen better days come the half hour mark, but it’s still functional at least. That’s a minor miracle indeed, especially when you remember that neither it nor the Galaxy S6 Edge that it was pitted against are marketed as being even remotely waterproof, or even water resistant for that matter. Samsung’s Galaxy S5 was in fact sold as a waterproof device and received rave reviews because of it, with Samsung deciding to ditch the feature this time around in favor of premium design. Apple has never claimed any of its smartphones to be waterproof or water resistant, with the Apple Watch its only offering that is capable of going for a dunk – and even then we’re not sure we’d want to drop it into Red Bull! So at the end of all this we now know that Apple’s smartphone likes Red Bull more than Samsung’s which doesn’t say a lot considering we don’t expect many people to be dropping their phones into a can of the stuff. Check out the video in its full glory below and be sure to drop us a comment in the section as well. Have you ever dropped your phone in a sugary beverage? How did it turn out for you? Honestly. Its decent video but I’m my next phone won’t be iPhone, I prefer Android. In addition its not that drop my phone in liquids anyway. Ugh. Redbull. I never drank it and won’t drink it at all. Its bad. Android have a vulnerable virus. Google it. I know. As if iOS doesn’t have vulnerabilities either. Recently a keychain vulnerability was brought to light and apparently Apple knew about for over 6 months. No OS is entirely safe. Have fun with the Android. I’ve had both, and the ease of use and the apps are just so much better for the iPhone than Android. The quality of the Apps are what I am talking about specifically. I think Android is the opposite of iOS. There is too much customization with the Android, you have to install way to many tweaks and such to get things the way you want it. Also, if you want free versions, they come with ads that will drive you bonkers. iOS on the other hand is a little too controlling. They are starting to break down those walls as of late though. iOS 9 is very impressive so far and I am sure the more they open things up for developers the better it will be, especially since they are sandboxing all of it so that they need to conform to their high standards and keeping the privacy safe. I think it is a matter of getting used to on both platforms….i like how apps have their setting within the app and not thru iOS settings…. Can…can I have the phone Red Bull? I don’t know why, but I have a sudden desire to drink a V8. Weird. Forget Redbull. What I want to see them do is go to a tropical vacation hot-spot and conduct the same test….with sea water! Salty sea water is an excellent conductor of electricity. I’d live to see how long these phones would survive in that! I used to be an Android man myself too. But I was really ticked off with the half baked apps that lazy developers were uploading to the Play Store. Apps for iOS on the other hand are way more polished and ready for prime time thanks to Apple’s app vetting process. Even were the developer makes the same app for both systems, the iOS version usually works better. As for customization, if you want that, that’s what jailbreaking is for. When you have a jailbroken iPhone, you really don’t miss Android. iOS doesn’t have that keychain vulnerability, only OS X. I’m inclined to agree with everything else you said though. I disagree. Ive used android for over a year now, and i havent had a problem with malware. Its a matter of what sites you visit and what you download. iOS isnt entirely safe either, there were incidents where apple wasnt in a hurry to patch security risks either. Its the matter of how you use your phone, yes android is open but that doesnt mean android is not safe to use. Android isnt preinstalled with viruses you know. First off the issue is with Samsung. Second don’t think if your going to use iOS you’ll be safe. Just like samsung, Apple’s iOS has its flaws and not every one you’ll know about. Third, I don’t think twice before buying an Android, I’m not going to abandon using my android over a flaw that could get fixed in the future. You don’t see ppl giving up iphone when there is a security flaw.